Built-in charger. Just plug the cable into a power socket. Most models available in stock now. For more information call 0370 850 1400 today. Most models available in stock now. For more information call 0370 850 1400 today. Free shipping! Features a built-in charger for fast and easy charging – just plug it into a power socket. An in-vehicle charging system is also available for charging while travelling on delivery vehicles. It features intelligent control to operate only when the main vehicle engine is running. The 208° steering angle enables smooth and easy manoeuvring and ensures safe handling. 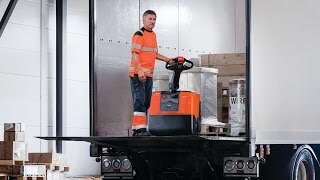 The BT Levio LWE130 is a lightweight truck perfect for applications in confined areas such as retail, shops and supermarkets, as well as on-board delivery vehicles. The LWE130 is simple to use thanks to its quiet operation and programmable driver parameters. This truck comes with a built-in charger for fast and easy charging, and has improved energy efficiency because of the AC motor. This truck is equipped with telematics hardware, making it a smart truck that can be connected. This allows you to easily monitor its activity and improve its productivity, safety and efficiency.